"Mondays, am I right?" 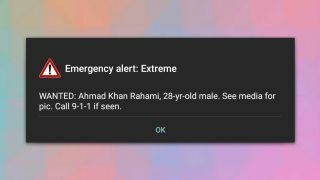 This seems to be a worryingly pervasive attitude toward the cell phone alert used in hopes of capturing Chelsea, New York and Elizabeth, New Jersey bombing suspect Ahmad Khan Rahami. If you were within a certain radius of New York City at around 8am ET on September 19, then chances are you were jerked from a sleepy, Monday morning commute by a wanted message similar to an AMBER Alert for people gone missing. The all-too-familiar, shrill and piercing tone was accompanied by a simple message on everyone's lock screens: "WANTED: Ahmad Khan Rahami, 28-year-old male. See media for pic. Call 9-1-1 if seen." The tone of responses on social media and from various publications has ranged from disgruntled to divisive to downright doomsaying, with many stating how this alert had put them "on edge" or implying that the alert was somehow more alarming than the allegedly terroristic acts themselves. While the nuances of this alert and those like them have vast room for improvement, something that Motherboard has done an excellent job of highlighting, such a response is asinine at best and offensive at worst. To imply that you were put on edge or bothered by an alert designed to catch a wanted man with expertise in explosives flies in the face of the 29 people that have already been injured by this act of violence. According to The New York Times, this could very well have been the first time that the Wireless Emergency Alert (WEA) system has been used to issue what essentially was a wanted poster. Unprecedented and worrying? Definitely. Unnecessary and irresponsible? Not in the least. Frankly, to put you on edge is exactly what the alert should have done. When there's news of a bombing suspect actively about in the places you live and work, to be on edge is exactly the correct response. The crux of the issue comes down to how authorities are using – and how they should be using – technology to protect innocents from harm. It's clear that law enforcement needs us as much as we need it in times like these, and the use of this alert was an obvious demonstration of that fact. Convenience or privacy and security have been at odds since well before the onset of modern technology – the two concepts are practically diametrically opposed. This is obviously a slippery slope that we've been slowly sliding down for more than a century, but it's also important to face the reality of our time. The offense to privacy or peace of mind in using the WEA system in such a way is far outweighed by its potential benefit. Before the turn of the decade, we hadn't seen an act of terrorism on American soil since 9/11, meanwhile terrorist attacks have occurred with frightening frequency throughout western Europe (and beyond) before and since. For as much as we want law enforcement to quell these threats while maintaining the public's peace of mind, that's becoming less and less of a possibility without unnecessarily putting even more lives at risk. Frankly, at this point – after more terroristic acts in the US within the past two years alone than I care to count – for law enforcement to not use tools like the WEA to apprehend a suspect before any more harm is done should be seen as irresponsible. Yes, the WEA standards are in sore need of updating, like the length of their messages and sorely missing image support, but that's not a reason neglect the tool. Alerts like these aren't intended to incite manhunts or sow fear in the public, and the law enforcement and governmental bodies involved have done nothing to imply such a thing. They have one purpose, to ensure that everyone potentially in danger is aware of that fact. Sure, this all digs up memories of reading "1984" in high school and watching "V for Vendetta" when we were pseudo-intellectual college kids. But, don't we all also remember the years following 9/11 when our general state of calm was dictated by a color? With or without much-needed improvements, the WEA system could very well be instrumental in subduing future perpetrators of violence before they strike again. I'd take a useful, well-intended and localized alert over a general malaise of orange-colored unease any day.